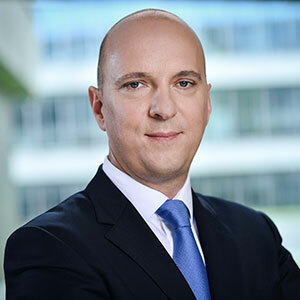 Andrzej J. Kozłowski is the President of the Management Board of Emitel S.A. from January 1, 2018. He has more than twenty years of professional, business experience in Poland and abroad. Prior to taking up his current position, he worked as the Executive Director for Strategy and Project Management at PKN ORLEN SA. He was also the Management Board Member at Unipetrol a.s. in the Czech Republic responsible for Strategy and M & A, the Chairman of the Supervisory Board at ORLEN Upstream Sp z o.o. in Poland and a member of the ORLEN Upstream Canada Ltd. Board of Directors in Canada. Previously, for over 10 years, he has been involved in the telecommunications and new technologies sector working as an advisor and manager in Polish and international corporations. Mr. Kozłowski graduated from WSB – National-Louis University in Nowy Sącz in the field of Management and Marketing. He also holds an MBA from the Maastricht School of Management in the field of corporate strategy and industrial policy. Mr. Kozlowski is a member of Advisory Board at Atlantic Council in Poland and also a member of Radio Communication and Multimedia Techniques Foundation Board. He is also a lecturer at the Youth Leadership Academy – training program aimed at academic world with a goal to find and strengthen the competencies of young leaders.